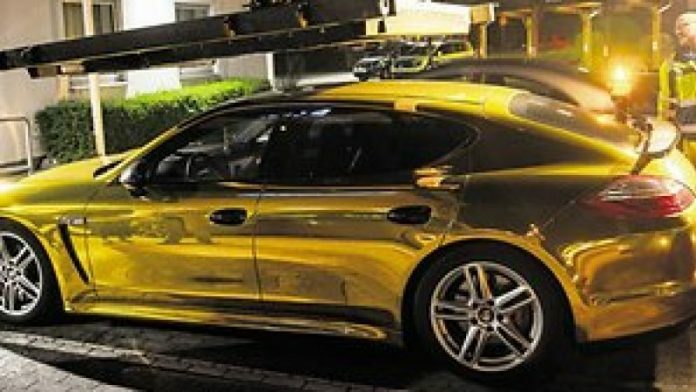 Hamburg’s Morgenpost reported April 12 that the 31-year-old driver was stopped in the northern city last week and told his Porsche Panamera, sporting a reflective gold foil finish, might blind other drivers and was a danger. He was told to remove the foil and re-register the car, but police say he continued to drive it. The driver was stopped again Wednesday and police took his keys, papers and license plate, before the vehicle was towed to a garage. He was fined an unspecified amount and will have to remove the foil to make the car street-legal again.